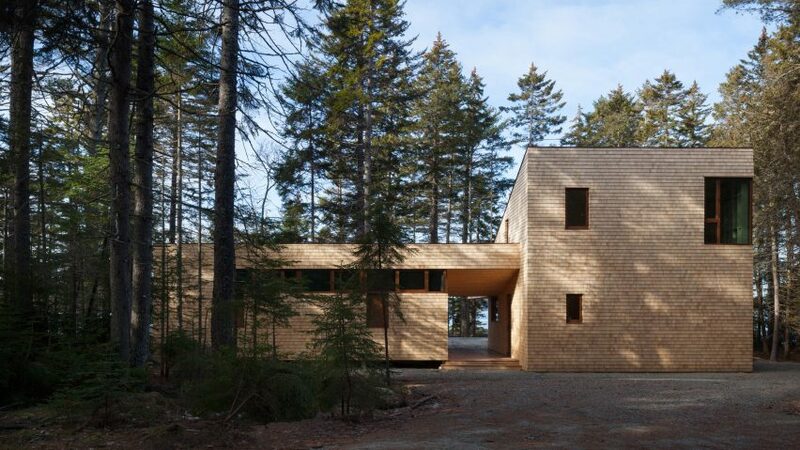 Matthew Baird's Somes Sound House in Maine "sits lightly on the ground"
Cedar-clad volumes connected by a breezeway form this residence in Maine by American studio Matthew Baird Architects, which was designed to respect its forested surroundings. 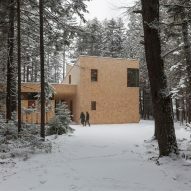 The Somes Sound House is located on the edge of Acadia National Park, on a remote site blanketed with evergreen trees. 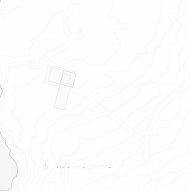 Situated at the end of a peninsula, the dwelling overlooks mountains to the east and a fjord to the west. The site offers a dramatic backdrop for the family retreat. "Tall spruce and pine trees contrast against the sea, and the ground is covered with granite outcroppings, moss and lichen that roll down to the water's edge," said Matthew Baird Architects, a New York-based studio founded in 2002. 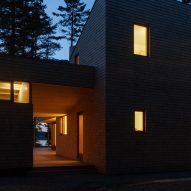 The vacation dwelling was designed for a young urban couple with two boys. The property, formerly undeveloped, had been in the family for years and had served as a beloved camping spot in the summer. 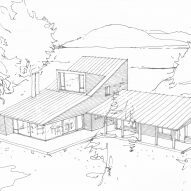 The architect was charged with creating a year-round dwelling that would pay heed to the natural landscape and tread lightly on the earth. "We were encouraged to embrace a modest expression worthy of the site and to make a structure that would sit lightly on the ground," the team said. 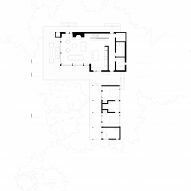 L-shaped in plan, the building comprises two wings clad in cedar shakes and separated by a breezeway. The main wing, which rises two storeys, was "winterised" and can be inhabited throughout the year. 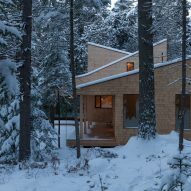 The other volume, which is single-storey, was envisioned as a sleeping wing to be used during summer months. 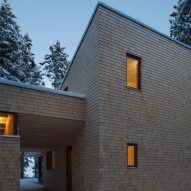 The home's east elevation faces the mountains and was left mostly solid. 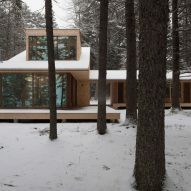 The building opens up on the west, where ample glazing offers generous views and the roofs slope down toward the water. 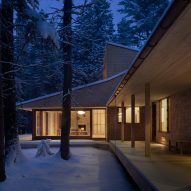 A walkway wraps the western side of the cabin, where a deep roof eave provides protection from the elements. "The circulation is exterior and protected by a rudimentary porch that is meant to affirm the simple idea of shelter while engaging the scenery of the fjord," the team said. Within the primary wing, an open-plan kitchen, dining area and living room occupy the ground level, and a master suite is located up above. The sleeping wing contains two bedrooms connected by a shared bathroom. 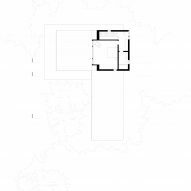 In the southwestern corner of the home, the team created a space for extreme solitude. "Located at the farthest end of the southwest wing is an isolated room for the owner, offering views to the wooded landscape and the sea, creating an intimate space desired by a writer escaping the hectic pace of the city," the team said. For the interior design, the team used a restrained palette of materials and colours, which creates a tranquil atmosphere. 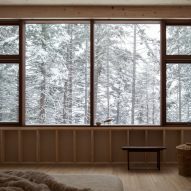 Rooms are fitted with simple decor, and ceilings and floors are wrapped in wood. In the public area, a tall stone fireplace serves as a focal point and provides warmth on chilly nights. 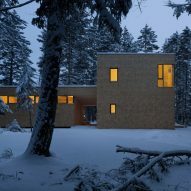 Known for its pine forests and rugged shoreline, Maine is a popular spot for modern homes situated in natural settings. 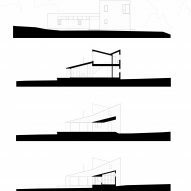 Other projects in the northeastern state include a dwelling by Carol A Wilson that features black cladding and red trim, and a seaside residence by Elliot + Elliot that sits atop wooden piers. Photography is by Elizabeth Felicella.